FullTiltPoker.com is one of the poker rooms which offers the service of being able to transfer money to a friend. This is a really great feature if you have a friend who wants to start playing poker at FullTilt but have no means of making a deposit. In this case you can simply send him some money on Full Tilt and he can start playing instantly. 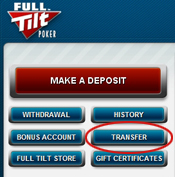 How do i transfer money to a friend at FullTilt Poker? Making a buddy transfer at FullTilt is really simple. All you need to do is to follow the steps we have provided you with on this page. 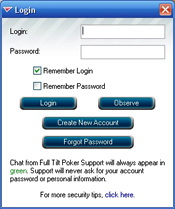 Step 1: Log in to your FullTiltPoker.com account. 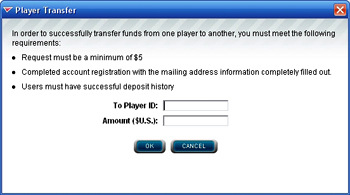 Step 4: Enter the FullTiltPoker player ID of the player that you want to transfer the money to and enter the amount of money you want to transfer and then click OK. Step 5: Verify the details of the player to make sure that the money ends up in the correct account then click OK to finish the transfer. As you can see it is really simple to transfer money to a friend at FullTilt.com. Keep in mind that the minimum amount that you can transfer to a friend is $5. Dont forget to tell your friend to use the Full Tilt Poker referral code when he creates his account since this will give him a free $600 bonus.